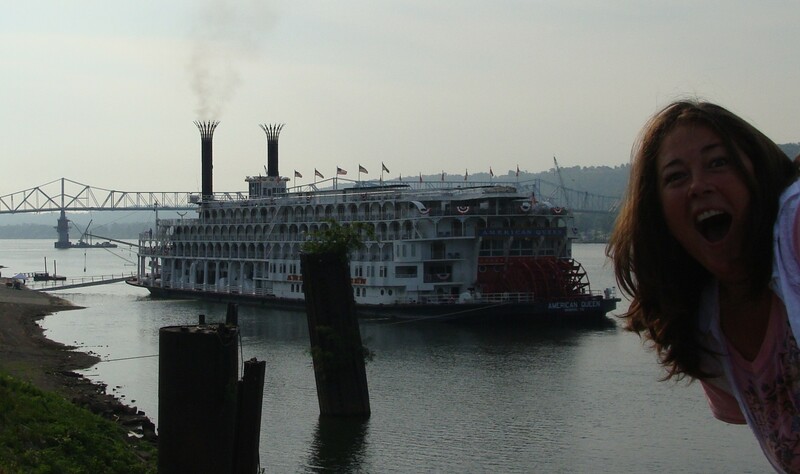 On July 12th I saw my first riverboat. I’m not talking about a dinner/dance cruise boat, or a yacht, but a Twainian escape from my 2012 landlubber self. I was a kid again, my own female version of Huck Finn. I knew riverboats existed. I’ve been to St. Louis and I’ve lived on and near many rivers, but somehow I’ve managed to never see one. The closest I came, if you can call it close, is a casino boat that stayed docked. Nothing had prepared me for this. I was rounding the corner to Madison Coffee & Tea to blog while having my morning iced chai latte and cranberry muffin, when I almost slammed into Carey, who works there. She was craning her neck looking down toward the river. I could see it looming over the riverbank from Main Street. The blog, I knew, could wait. I HAD to get photos. I texted a photo of myself, taken, um, not at all from the wrong side of the guard rail of the overlook. 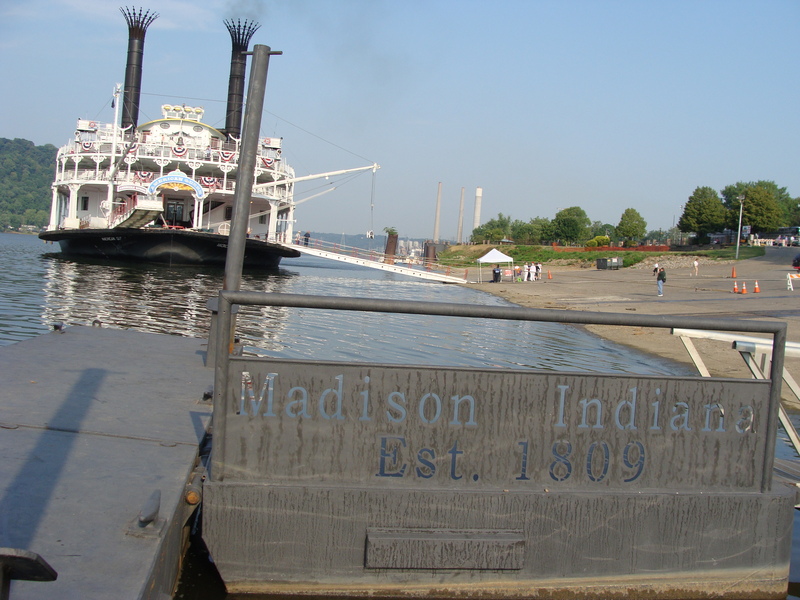 Of course, Madison’s good side is seen as easily on shore as off, but you can’t help going through your list of riverboat songs and books when you see your first one. The rest of the day was spent writing an essay weaving our time living in different places along the Ohio River: where it formed, in our Pittsburgh area home; living under the mothman legacy in Point Pleasant, West Virginia; watching the locks in Evansville, Indiana; and falling in love with a town called Madison. There are threads of CCR and Twain, and I hope I can share it with you if I’m fortunate enough to have it published. 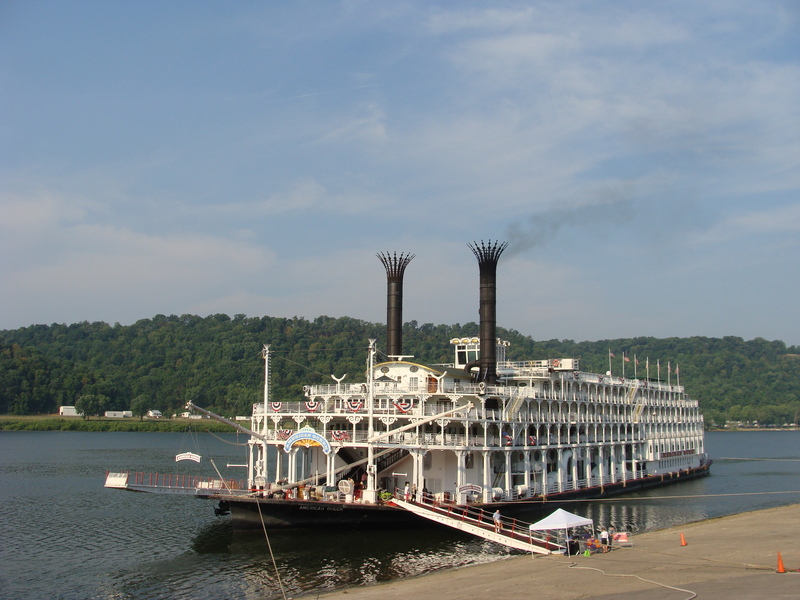 The essays flushed out further when I added what I learned of this riverboat and her now dead predecessors. 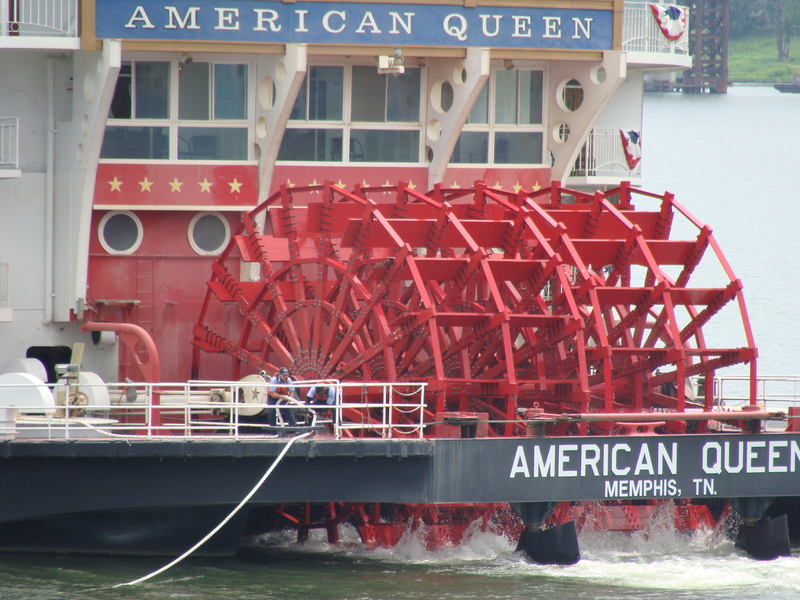 The Mississippi Queen and the Delta Queen previously came through Madison, but the Miss. has been dismantled, and the Delta was decommissioned due to a shameful regulation about boats with wooden structures, meant to make ocean voyages safer, but not really essential to inland waterways. Nevertheless, the ruling applied to both, and the Delta Queen met an untimely death. I felt like I was mourning someone I never met. I returned to the cafe with photos for Carey and put out a reader challenge on Facebook for anyone in the upriver ports to take a photo. I received some wonderful photos from Amy Cornelius Dembosky of Pittsburgh. Photo courtesy of Amy Cornelius Dembosky. 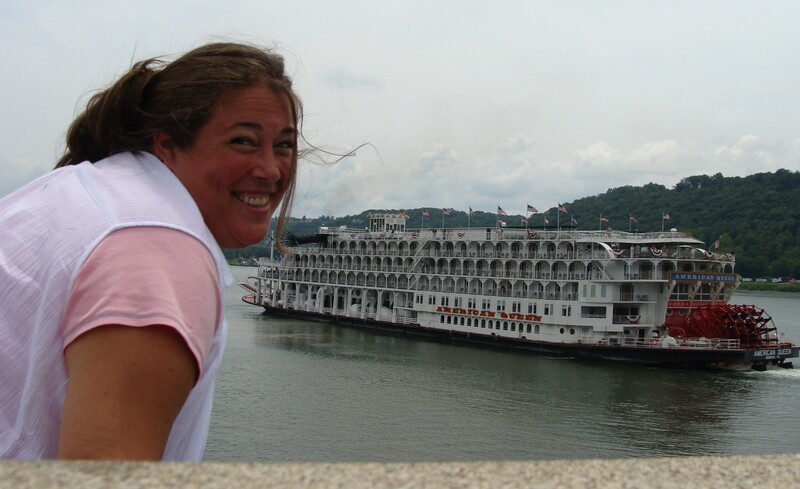 Look how she dwarfs the boat going up the river, and even her size in comparison to the stadium! 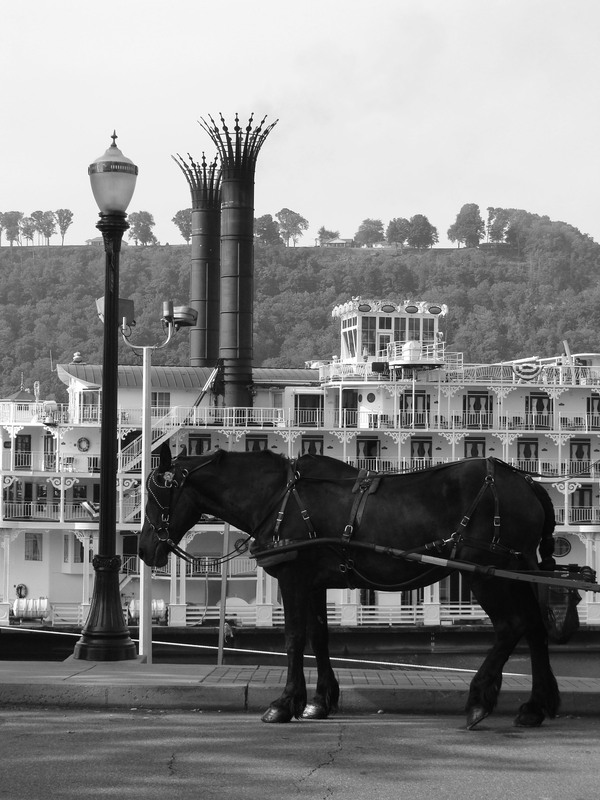 The wonderful Amy Cornelius Dembosky, who dropped everything to go nab a photo for me of the American Queen docking in Pittsburgh. Thanks Amy!! Thanks to both Carey and Amy, I got to have yet another new, wonderful adventure. Both are getting a jar of jam. After I posted the photo request on Facebook, I picked up lunch at The Attic and returned to the river to wait for the departure. I giggled with excitement and texted friends, and snapped photo after photo and lingered, even after the smokestacks were lowered. I thought something in me needed to watch her leave. 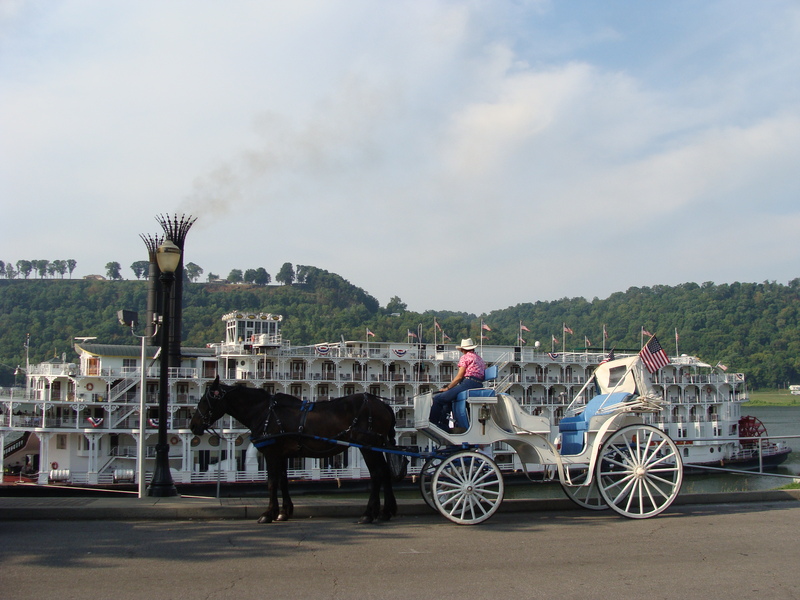 Nobody had forewarned me that riverboats play music, and I almost cried when the calliope started. 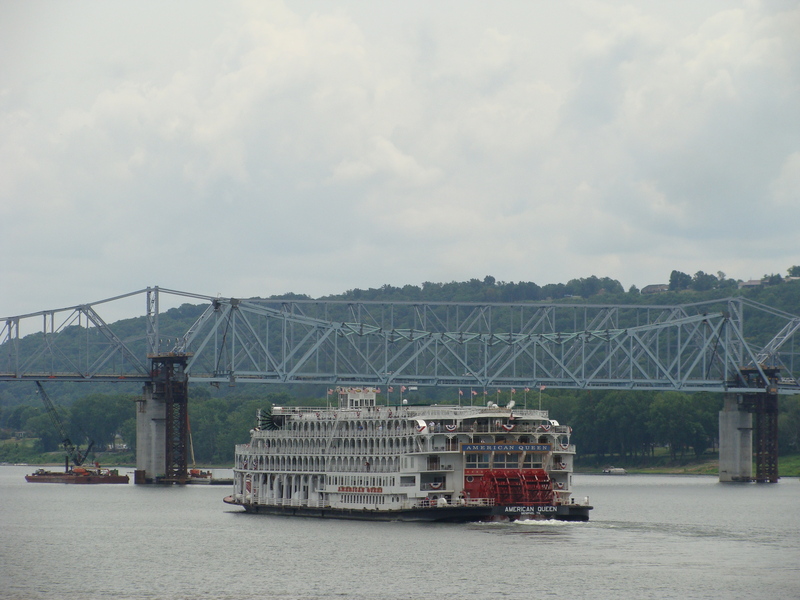 Cliff Stookey, a man I met on the overlook, told me to listen for the boat to switch to the Mickey Mouse tune as it passed under the Madison-Milton Bridge. The boat pilot, he explained, has a friend who lives near the bridge, and he plays it for his friend every time. I could relate. I was playing my own game of imagination, about figuring out how to hitch a ride on that riverboat queen. I really was a kid again, if only for the length of the calliope’s concert. I hope these videos can give you a little of that feeling, too. 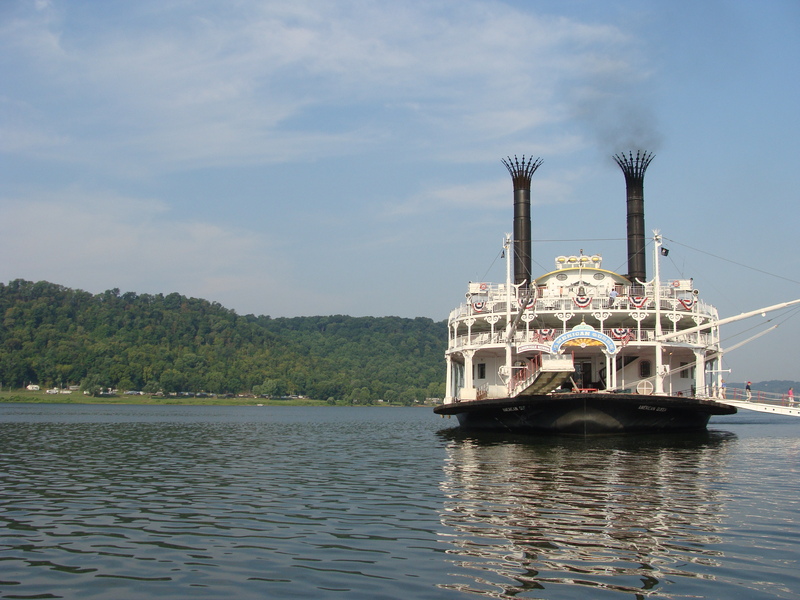 Cool post, sis…wouldn’t it be nice to cruise that thing all the way down to New Orleans! And yes. Yes, it would!